If you love the look and feel of the Volkswagen Golf, but need more performance than the original can offer, then the 2018 Volkswagen Golf R is the perfect answer to your conundrum. Keeping the classic Golf build, the 2018 VW Golf R adds plenty of power and a vast selection of performance features and technology. Of course, it's easy to state the power and superiority of the 2018 Volkswagen Golf R, but it'd be much more useful to show those interested. Therefore, we want to take time today to inspect the details regarding Volkswagen's iconic performance hatchback. Join us as we dive into the details of the specs and features that come included with your purchase of a 2018 VW Golf R.
Where Can I Get the 2018 Volkswagen Golf R? 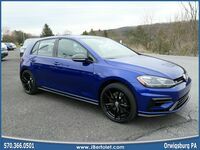 Interested drivers can find 2018 Volkswagen Golf models, including the 2018 VW Golf R, available here at the dealership of J. Bertolet Volkswagen. Interested drivers who desire more information, or wish to schedule a test drive, can contact us with ease. Visit us to find out if Volkswagen's fun and thrilling performance hatchback suits you!